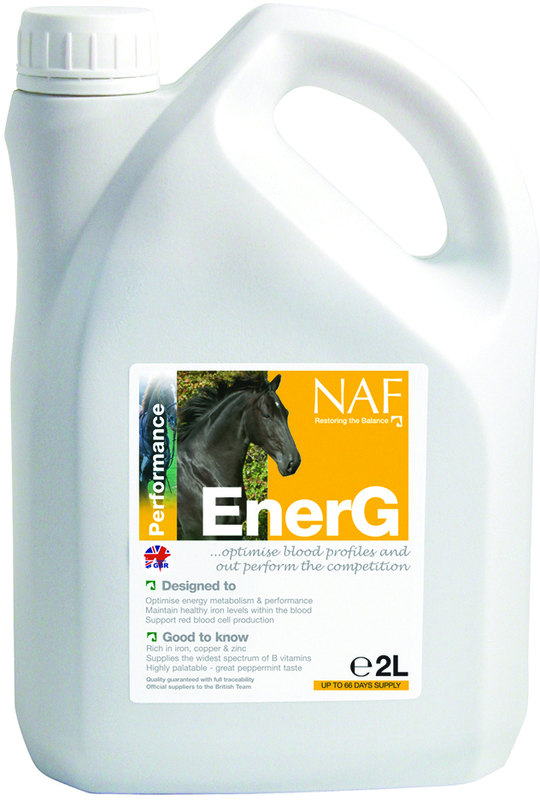 NAF EnerG contains iron; copper; zinc; Vitamin B complexes; Vitamin C & K. Iron is essential for your horse's health & performance; low levels can result in lethargy & a decrease in performance. As well as being ideal for competition horses, EnerG is also beneficial for horses who are lethargic, or recovering from an illness. EnerG is peppermint flavoured, so your horse will love the taste. Also available & ideal for use at competitions, are EnerG Shots, which come in easy to use syringes. Feeding Instructions- For day to day use, feed at maintenance rate, but during times of peak performance, feed at loading rate. Horses- Loading rate (3-5 days) feed 60mls daily Maintenance rate feed 30mls daily Ponies- Loading rate (3-5 days) feed 45mls daily Maintenance rate feed 15-30mls daily 2 litres will last a horse up to 60 days (based on 30mls daily) & a pony up to 133 days (based on 15mls daily) 5 litres will last a horse up to 166 days (based on 30mls daily) & a pony up to 333 days (based on 15mls daily) NAF is part of the BETA NOPS scheme.